The seven-year-old boy, who is in the thoughts of all Tuva, came back to the republic. His mother Anisya Kiim-oolovna Mongush informed us that he is already back in Chadan and is in good spirits. He talks all the time without stopping, regardless of the fact that his speech is unclear. The Tuvan students who met him in Moscow at the Vnukovo airport also said that. They spent about 2 hours with him. “We were surprised by his energy. He told us everything about his illness, and many other interesting things,” said a member of the Moscow Tuvan association, Aziata Darzhaa. 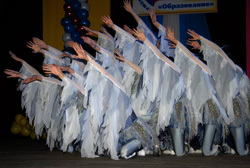 The children’s choreographic ensemble “Alantos” (leader Raisa Stal-ool) celebrated the 15th anniversary of its founding by a jubilee concert. Today, it is not necessary to translate its beautiful name even beyond the borders of this country. Alantos is a species of lily that blooms on the Azas lake in unknown and beautiful Tuva. And its beauty, grace and fragility has been expressed for years by young ballerinas from children’s choreographic school of Kyzyl. Collection of the means to help seven-year-old Arat, who has a brain tumor, is going on in Tuva. The action was initiated by Tuvan reporters. As soon as the first announcement that the little boy needs urgent help appeared, the Tuvan journalists immediately reacted. Quickly, contact with Arat’s mother, Anisya Kim-oolovna was established. She was invited to a press conference, where she told the reporters about her son’s condition. The chief of Regulation of Courts, Alexandr Saryglar, deputy of Legislative House, president of foundation “Mama” Galina Munzuk, merited artist of Republic Tuva Galina Syuryun, and chief of department of propaganda of the “United Russia” party Saima Dalchin came to her support. Today is the 84th birthday of one of the first Tuvan novelists, doctor of historical sciences, the famous researcher of shamanism, Mongush Borakhovich Kenin-Lopsan. 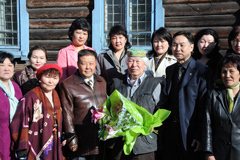 The head of Tuva, Sholban Kara-ool came to wish “Happy Birthday” to the shamanist researcher of world fame. Greetings! We live in Republic Tuva. There are three children in the family. Arat is the youngest one. He is seven years old. The cultural fund “Por-Bazhyn” will concentrate its efforts on finishing the construction of the unique Buddhist temple “Ustuu-Khuree”. The other project of the fund – the ancient island Uighur fortress, where in 2007-2008 extensive multidisciplinary archeological excavations took place, will be temporarily put on hold.